We know we generally advise against picking a wine on bottle design, but the limited-edition design of The French Wine Merchant’s Prosecco was irresistible. It helped that we’re obsessed with bubbles and knew we’d love it from not just looking at the bottle, but reading it as well. Whole Foods calls it “I Love You” All Year Round, though it is also (wordily) referred to as Villa Jolanda Vino Spumante Extra Sec (you’re more likely to find it online using the latter). The bottle, originally designed as a Valentine’s Day special edition, features a couple in hot air balloons together and hanging by the string of balloons as they fly solo. The wine was a bit lighter than champagne, but still had the sweet, bubbly taste we craved. It was a dry white, light and perfect for our humid summer weather. We didn’t pair it with anything but end-of-the-day relaxation, but we’d recommend lighter meals like fish, or with snacks/appetizers. The wine’s main set-backs have to be its cork and its rarity. Although its cork had a cute design on it, it was nearly impossible to remove – even for our wine expert, Kristen! And while rarity is usually a good sign, it’s sad to think we may never find this sweet, adorable wine again. 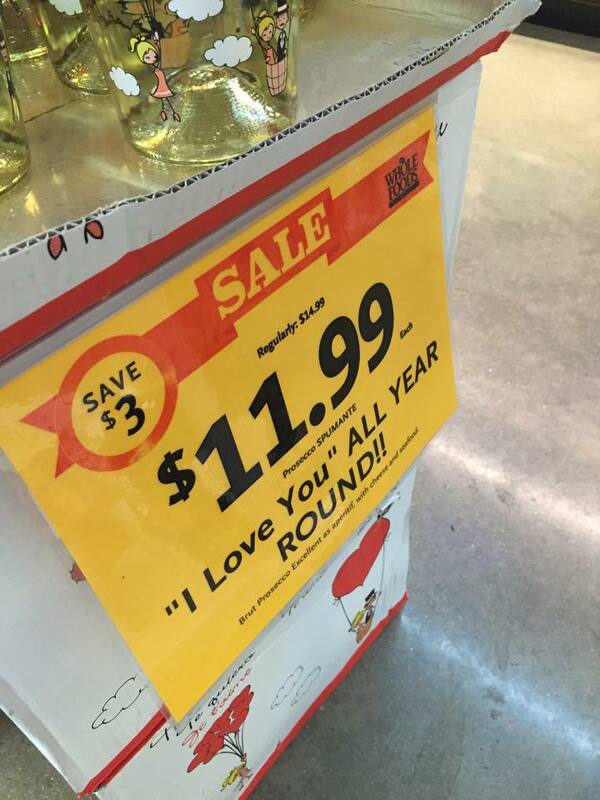 A bottle of I Love You All Year Round can range from $11.99-$16.99 and is around 13% alcohol.